What Jena High School Head Coach Jay Roark has done with the football program has been nothing short of spectacular. Since he has been hired in 2012, every year, the Giants have just gotten better and better. They have improved as a program so much that they are one of the top programs in the Cenla area. Since he has been there, you can see the development as the Giants finished 5-5 in 2012, 5-6 in 2013, and 6-5 in 2014 to dramatically improving over the last four seasons at 11-1 in 2015, 9-3 in 2016, 10-1 in 2017, and 9-2 in 2018. It also helps that the program has had some of its best talent to go through in nearly a decade. 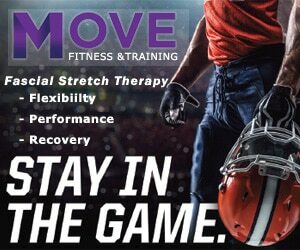 Players like TE Parker Fink (Northwestern State), WR JaRay Jenkins (LSU), QB Lamar Farris (Trinity Valley Community College), etc. have all signed at the college level during that time. 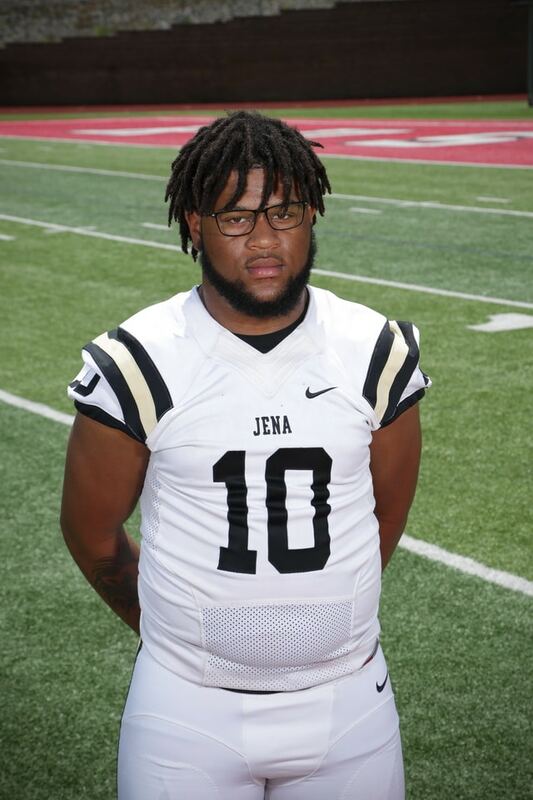 Heading into the 2018 season, the Giants had to replace both Jenkins and Farris, who both played huge parts in establishing the Giants as a Class 3A power. Luckily, players like SS Shaun Todd, LB Troy Dangerfield, OL/DL Aaron Boyette, OG Devin DeLaSalle, DE Thomas Bigner, and CB Zyrek Norell have stepped up to give the Giants their fourth straight nine plus game winning season in a row. Even though the Giants may have enjoyed a great season on the surface, a lot of the seniors thought that they could accomplish more. 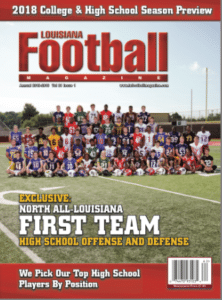 “I felt like we underachieved because we worked so hard only to fall short in the second round of the playoffs to Union Parish,” Dangerfield said. Even if the final record is debatable, there is no debate that the signing day period has been a success for the Giants as two seniors have gone on to sign with a collegiate team continuing the recruiting success the program has had for the last three years. 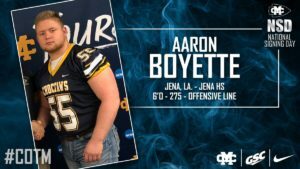 The first senior to sign is senior offensive lineman Aaron Boyette. Boyette was one of the best vocal leaders as well as one of the best overall players this past season for the Giants. As a three time team captain, 1st team All-District player, 1st Team All-Cenla selection, and second team Class 3A All-State selection, Boyette has been one of the key reasons that the Giants have had the amount of success over his four years there. 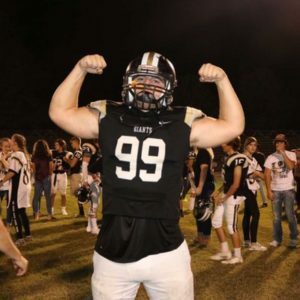 Even though Boyette’s biggest goal was to lead the Giants to a state championship, he thought that he did everything in his power to not only be a great teammate, but a great leader. Boyette certainly did that and more as his efforts attracted Henderson State, Mississippi College, and ULM. Henderson State and Mississippi College offered Boyette a full scholarship while the Warhawks offered him a preferred walk-on opportunity. 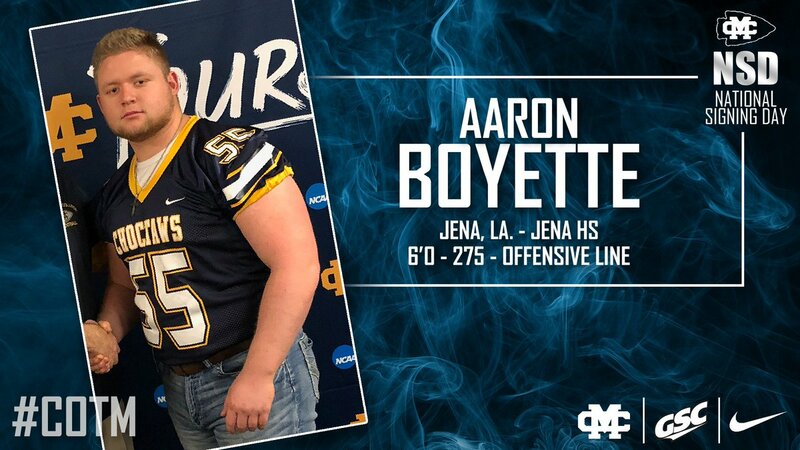 On National Signing Day, Boyette decided to sign with the Choctaws of Mississippi College. Boyette is also attending Mississippi College to go into studying kinesiology to go along with hopes of being a nurse anthesis. Like mentioned before, Boyette is not the only one to sign as his other big lineman teammate Devin DeLaSalle has signed with the other school that offered Boyette and that is Henderson State. 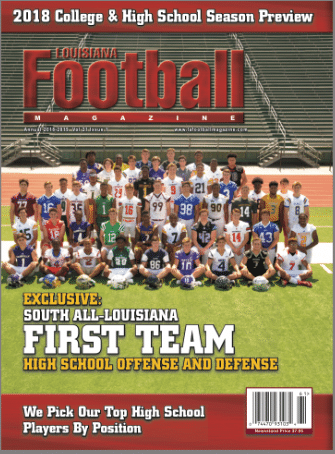 Louisiana Football Magazine’s recruiting specialist Lee Brecheen believes that both DeLaSalle and Boyette could be good fits at their perspective schools. Even though Boyette and DeLaSalle have signed, there are other players that Brecheen believes could play at the next level most notably Shaun Todd and Troy Dangerfield that have not yet signed. 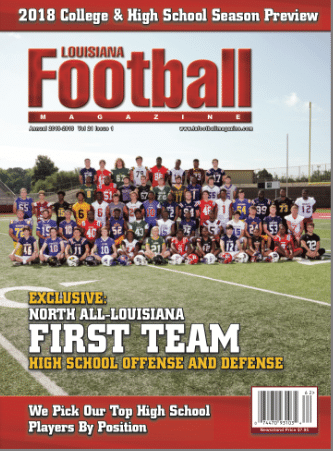 Brecheen has been very high on Todd since the start of the season as he placed Todd on the preseason All-North Louisiana team. Even though Brecheen believes Todd is a DI type player, he has only yet to receive one offer from Louisiana College. That is very surprising for a player that has been arguably the team’s best athlete last season and one of the team’s best players the last couple of seasons. Over his prep career, the 5-11, 182 pound defensive back has been named as a 2nd Team All-District safety his freshman season, a 2nd Team All-District safety and punter his sophomore season, a 1st Team All-District selection as a receiver, safety, and punter his junior season, and 1st Team All-District selection as a safety as well as a 2nd Team All-District selection as a running back. It is safe to say that Todd did a little bit of everything. Todd is dedicated to bettering himself as a player 24/7. That is how dedicated Todd is to play collegiate football. His teammate Troy Dangerfield is a player that has played on both sides of the football as both a running back and as a linebacker. He has been contacted by some schools, but yet has to receive an offer. Along with Todd and Dangerfield, Brecheen also believes that Bigner and Norell could find somewhere to play at the next level as well. No matter, who else signs in the end, the Giants will miss a lot of leadership that made the team so successful in years before. Even though Coach Roark will have to find those leaders, both Dangerfield and Todd have wise advice for next year’s team on how to handle adversity. “My advice is to never hold your head down because when you’re down, you never know when you can get a game changing play,” Dangerfield said. We will see if the Giants can continue their momentum as a program in the upcoming 2019 season.